The Department of Dance is at the forefront of contemporary dance through choreographic and performance exploration, creative use of technologies and reimagining the documentation of dance. Visiting artists and scholars enrich the program, as do study abroad and outreach opportunities. Students perform in the department’s own black box, the Barnett Theatre, as well as downtown and in area schools. Interdisciplinary collaborations with the Advanced Computing Center for the Arts and Design, and other departments, are frequent. The Department of Dance lives at the intersection of physical practice, creative process, and theoretical inquiry — where dance writing deepens performance, digital technologies expand choreography and historical study informs teaching. Students graduate from our programs with the artistry, ambition and creativity to be visionaries and advocates in the dance field and in their communities. Faculty members are internationally renowned choreographers and performers with broad professional experiences, teachers with records of excellence and innovation and artist/scholars defining the burgeoning field of dance studies and hybrid approaches to theory and practice. They have recently won Distinguished Teaching and Service Awards as well as recognition from Ohio Dance and the Greater Columbus Arts Council (GCAC). 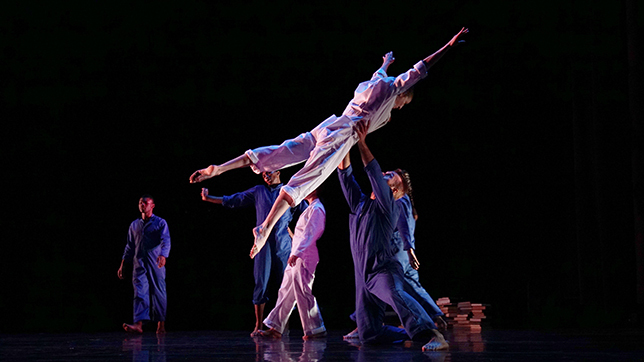 Each year, the department produces Dance Downtown, four graduate and undergraduate concerts, one faculty concert and one evening of dancefilm. Dance Downtown, presented at the Capitol Theatre in downtown Columbus, features 50 dancers and four resident or visiting artists choreography. The remaining events are held at the Barnett Theatre, the performance space laboratory in the heart of the department. Faculty also publish; particularly noteworthy are the database-oriented Mapping Touring, which focuses on the performance engagements of early 20th century dance companies, Dance in Transit, which explores the touring and travel of choreographer Katherine Dunham, Marion Cuyjet and Her Judimar School of Dance: Training Ballerinas in Black Philadelphia (Edwin Mellen Press, 2011), Albion’s Dance: British Ballet during the Second World War, (Oxford University Press, 2016) and Honest Bodies: Revolutionary Modernism in the Dances of Anna Sokolow (Oxford University Press, 2017). The Department of Dance and ACCAD work together with shared faculty, staff and curriculum. Project based curriculum and faculty and visiting artist research projects explore and further the relationships of dance, digital technologies and design thinking. ACCAD houses the interdisciplinary creative space, Motion Capture Lab, with state-of-the-art motion capture and intermedia capabilities. A four year project (2010-2013) with The Forsythe Company, providing a broad context for research into choreographic practice. The creation of online digital scores in collaboration with guest choreographers are publicly available. Dance Wellness: Where Medicine Meets the Arts a collaboration with The Ohio State University Sports Medicine. Dancers and artistic faculty and staff work with a team of rehabilitation specialists to promote health and wellness for the performing artist/athlete. On site and backstage care, pre-season screenings and an elective course in dance wellness are all provided. To advance the art of dance through the use of a system of notation. Each year DNB assists in staging around 150-200 performances from scores. DNB’s Extension for Education and Research is located at Ohio State.